The stage is set for Banbridge Musical Society’s fantastic production of Annie the Musical, opening in the IMC Theatre on Wednesday November 16. There will be six shows over four days, with matinees on Saturday and Sunday. 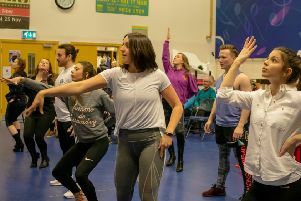 This is the Musical Society’s 45th big show, and it has been produced by a brand new team including Director Ian Milford, Musical Director Niall O’Flaherty, and choreographer Lynn Gourley. Annie, the classic Broadway musical based on the comic strip Little Orphan Annie, Is a tale of hope in the depths of the great depression in 1933 New York. Tiny orphan Annie, a larger than life character, is played by the wonderful Grace Killen, aged 10. The audience will be transported on an energetic musical journey as feisty Annie strives to escape the orphanage and mean old Miss Hannigan (Nicola Brenchley) to find the parents she believes will one day come looking for her. When she goes to live for a week with billionaire politician Oliver Warbucks (Jim Daly), Annie finds the opportunity to really search for her family. The adult cast, all seasoned performers with Banbridge Musical Society, are joined by a fantastic group of principal orphans who each have an impressive list of roles behind them. The children’s chorus, awash with talent in both singing and dancing, will inject huge energy into this show, and the teen and adult chorus will also knock the audience for six! Featuring fantastic songs including Hard Knock Life, Maybe and Tomorrow, ‘Annie the Musical’ is a show that will make anyone’s heart sing! Tickets are going fast with some shows already sold out. Call into Brown Bear, Newry Street, Banbridge, or ring 07707 698840 to book your seat.